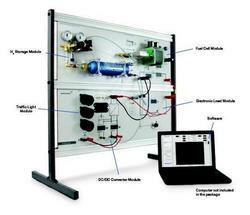 The Dr Fuel Cell Professional is designed for class demonstrations of experiments and hands-on use by students. 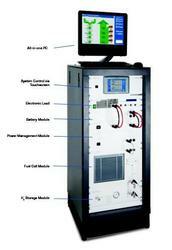 The system represents a complete energy cycle based on solar-hydrogen fuel cell technology. The Integration System is ideal for demanding application projects. With its 1.2 kW fuel cell module, matching DC/DC converter and a software facilitating overall system control, training and research projects can be implemented easily. The 1200 Fuel Cell Module is based on the FCGenâ„¢ 1020 ACS stack from Ballard. The system features a high system efficiency and superiour life expectancy for the stack. The robust housing protects the internal system components. All interfaces are provided on the back of the unit at one level. Integrated rails, the 19â€œ format and high flexibility with respect to the installation position and ventilation simplify integration of the system. The included startup kit enables easy startup of the system in the lab. The Nexa® DC1200 transforms the nonregulated output voltage of the fuel system to 24/48 V DC voltage and enables battery hybridization. The Nexa® OSC Software can be used for efficient overall system control of the Nexa® 1200 and Nexa® DC1200. Data from all components can be centrally parameterized and visualized. The fuel cell module, DC/DC converter and Overall System Control Software of the Nexa® Family are optimized for maximum compatibility. This enables fast and easy implementation of stationary applications. The Clean Energy Training Equipment allows experimentation with the supply of power through renewable energies and hydrogenbased energy storage. The experiment set is designed for basic training needs. It includes all the components needed for setting up an autonomous energy system. Users can observe in detail the entire energy conversion chain, as well as the individual technologies of wind, solar and hydrogen power. The learning and experimentation software allows the selection of different weather and user profiles, which can be used to combine the individual components to create optimized complete systems. The user therefore develops competence in the design of energy systems. * Determining the characteristic curve of a fuel cell. Clients can avail from us this range of Clean Energy Training Equipment at most affordable prices. The Instructor Integration System is suitable for labs and smaller application projects. The modular design and transparent interfaces make it easy to integrate. The system includes a 50 W PEM fuel cell stack and a microcontroller board. An optional hybridization kit extends the power range by means of battery hybridization. The components are connected by a small number of highly transparent interfaces. This allows flexible use of the available space. The software measures and visualizes important system parameters, such as stack current, voltage and temperature. Use of the system is safe and reliable. Hundreds of these systems are already in use around the world. Frequently used for school competitions and university projects. Max. Power Output: 50 W.
Rated Voltage: 5 V DC. Dimensions (W x D x H): 120 x 103 x 135 mm. 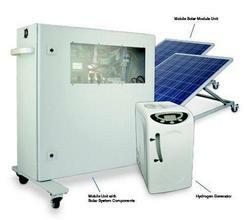 The Solar Hydrogen Extension is a complete off-grid photovoltaic system combined with an electrolyzer. It produces hydrogen from clean solar power and can be combined with various Heliocentris products. 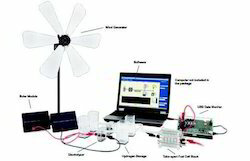 The system can be used to implement exciting projects such as constructing a stationary autonomous power supply or a concept car with a hydrogen filling station. The product extension enables complete balancing of the solar hydrogen generation. Performance and generation data of the solar modules, power electronics, battery and electrolyzer are displayed within the included software and can be logged for exporting. Energy flows between the individual components are clearly visualized. Mobile solar modules with adjustable angle of inclination and various solar sensors allow for in depth experiments on solar power generation. Instructor Training System (p. 6). Instructor Integration System (p. 7). Nexa® Training System (p. 8). Nexa® Integration System (p. 9). FC-42 Evaluation Kit (p. 11). The DC1200 transforms the nonregulated output voltage of the fuel system to 24/48 V DC voltage and enables battery hybridization. The OSC Software can be used for efficient overall system control of the 1200 and DC1200. Data from all components can be centrally parameterized and visualized. The Training System allows practical preparatory experiments in the design and hybridization of an energy system using fuel cell technology. The system is designed for advanced instruction. Power systems can be simulated on the basis of industrial system components. The fuel cell module, hydrogen storages, battery and power electronics can be examined and influenced separately. The Training System enables complete output balancing â€“ from the source through the internal energy conversion stages all the way to the sink. Data acquisition and system configuration are conveniently executed via computer. Users learn about load profiles, efficiencies and design criteria, making them experts in system design. 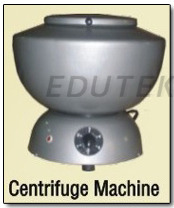 This centrifuge having better speeds and capacities fitted with resiliently mounted motor for vibration free performance and 5 step regulator. Body made of steel duly powder coated paint finish. Round lid with handle available in 6 tubes.